There is every likelihood that Orkney would be significantly different today had it not been for Magnus Erlendsson, son of Earl Erlend, subsequently sanctified as Saint Magnus and still a central figure in Orcadian culture. The Saga continues to pour praise upon Magnus so it is of little surprise that Hakon was encouraged by his supporters to be rid of his celebrity kinsman. Norwegian Earls did not die peacefully in their beds – if not in battle, then nearly all were slain variously by their uncle, brother, cousin, son or other claimant upon their earldom. 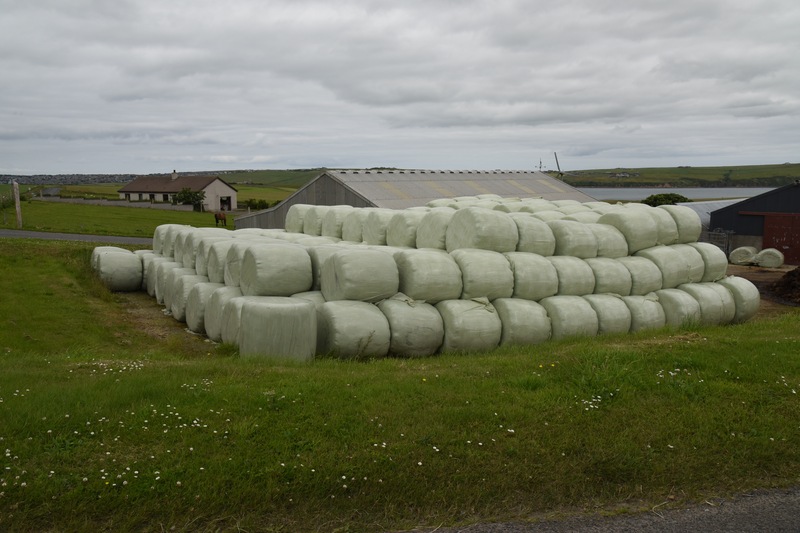 The dominant agricultural crop on Orkney is grass. Almost any field that does not physically contain prize beef cattle or other livestock is seeded with high-quality grass to turn into hay, haylage and silage to feed the animals through the winter. When we arrive on Orkney towards the end of May, we bring spring with us. At this stage the grass has barely grown an inch since planting. 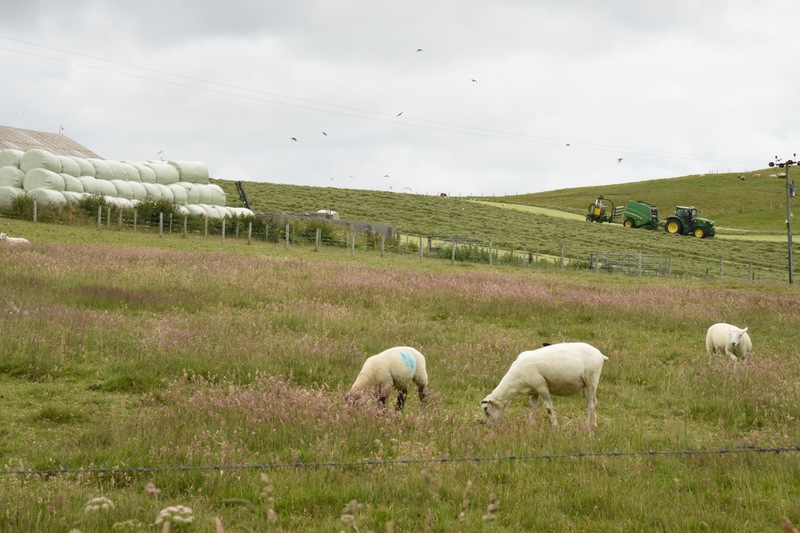 This year Orkney luxuriated in a particularly warm and sunny spring, so perhaps a little earlier than usual the first hay cuts were being taken well before the end of June. Now at the middle of July, cutting is proceeding at furious pace; wherever you look fields are being cut by mowers, rowed-up and turned by the raking machines, and now the baling machines are out. Mountains of silage bales adorn the land and the silage clamps are full and covered with tarp and tyres (not unlike that we removed from the Ness of Brodgar recently). The landscape is now a patchwork as shades of green are interspersed by the pale-coloured squares of freshly cut fields. Here’s a video showing silage baling using fancy machinery. Grass can be stored for the winter in a number of ways. Hay is grass that has been cut at a late stage of growth in order to reduce moisture content. It still requires time and effort to dry by spreading and turning it. However, Orkney farmers haven’t got the time or necessarily the weather for this – moreover, they also need to get three grass cuts from their land each summer season. Silage is basically grass that has been cut at an early growth stage and pickled using natural anaerobic fermentation – in theory it can remain usable for years. 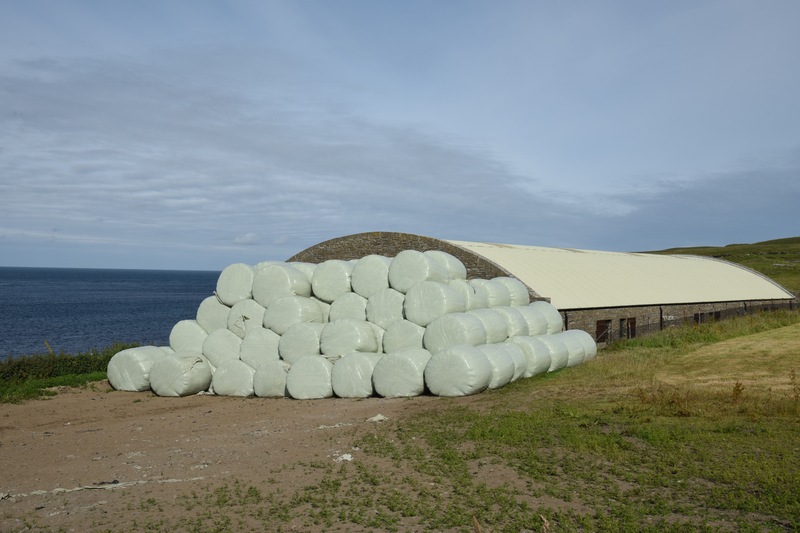 It is produced either by sealing bales in airtight packaging, as in the video, or packing several tonnes of grass into a “clamp” where it is pressed (by a heavy tractor), covered with plastic tarpaulin and weighted down with old tyres. For the latter the grass is chopped more finely and carried straight off to the clamp in a trailer rather than being dried in the field for a few days. However the clamping process can produce liquid effluent that needs careful environmental handling (although cattle reportedly like a drink of the mildly alcoholic liquor). Both production methods have a whole raft of advantages and disadvantages which one imagines the Orkney farmers spend a lot of time debating. Smaller quantities of green hay are also taken and lightly baled with mesh for drying in storage. Whether this meets the proper definition of “haylage” is a matter of opinion so we won’t go there. There’s a farm somewhere behind there! Meanwhile, a bit like these sheep, the Orkney mole is keeping his head down lest he gets his curls trimmed by a mower! The Orkney Mole apologises for the lack of recent reports. We have been experiencing broadband issues in the deepest reaches of Orkney Mainland. Although these are now ostensibly resolved, it has still been a struggle to get this post out with larger than average images. I spent a day helping the archaeologists and students to uncover the site from its protective winter covers – acres of heavy plastic sheeting and tarpaulin weighted down by thousands of old vehicle tyres. Our second attempt at getting over to Westray (see “It’s gone technical”) was successful and we were blessed with fine sunny weather for most of the day. If you have the opportunity there are many reasons to visit Westray for a day or more and not for nothing is it known as “Queen o’ the Isles”. To name just a few: the sheer Noup Head cliffs at the top of the island are the breeding site for tens of thousands of seabirds where you will see kittiwake, fulmar, gannet, guillemot and razorbill. There is a major archaeological rescue dig underway at the Links of Noltland. Explore the substantial ruins of medieval Noltland Castle. The best fish and chips in the known Universe are to be found at the Pierowall Hotel (book ahead). The Castle o’ Burrian sea stack is home to the biggest colony of puffin in the Orkney Isles. The latter was our chief reason for visiting now, before the parent birds head back out to sea – which most do by the end of July and leave the chicks to fend for themselves.